For this Wednesday, instead of sharing 'Wisdom' from my ancestors I thought I'd share a photo for another new feature, Wednesday's Child. This week's photo is of Leona Mae Bigham. 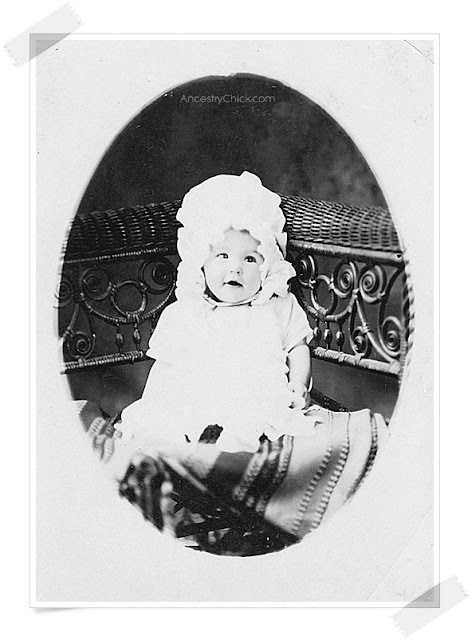 This photo was taken in 1924, when Leona was about four months old. Leona was my paternal grandmother's sister, born 31 January 1924 in Kansas. She was my great aunt, and my grandmother was Mable Louise (Bigham) Testorff. She was quite an adorable baby. Thank you so much, Jana. Very kind of you! Adorable! Love that huge bonnet!